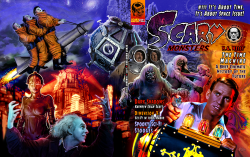 Scary Monsters magazine #111 - It's About Time! It's About Space issue! SPECIAL SURPRISE MAKES THE PAGES OF 111 COME ALIVE:. This is our second issue that is Augmented Reality-capable, which means a reader can use a free app for their smartphone to bring the cover art and some images on inside pages alive! See our Scare-Blog! above for instructions. SYNOPSIS: We go to the moon and beyond ... to far scarier places amid the stars and twilight, where time and space link to form new dimensions, but from an early filmmaking perspective! 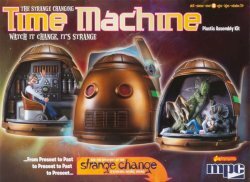 We highlight George Pal's The Time Machine; we look forward into the past with A Brief Cinematic History of the Future; we revisit The First Men in the Moon; we hear from Luigi Cozzi about his Starcrash and other films; and we take a look at Larry Buchanan's Mars Needs Women and Toho's Golden Age Spaceships. We also take a trip to the lighter side with The Three Stooges as they travel by rocketship and go into orbit; we talk with Dark Shadows star Kathryn Leigh Scott; we visit the Mothman Museum; and much, much more! Ordering Instructions: You must use the drop-down menu above to let us know whether or not you'd like to have your copy "bagged and boarded" (slipped inside an archival quality cello bag with a white backer board). Now enjoy a sneak peek preview video of #111 from award-winning horror host and Scary Monsters columnist Dr. Gangrene!